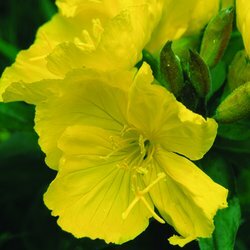 Evening Primrose has beautiful bright yellow flowers which are sweetly scented and can be used in salads or as a garnish. The roots and shoots can be used as a vegetable. The seeds can produce the oils which can be used in a number of ways such as in cosmetics and to help in the treatment of headaches eczema and high cholesterol. When the flowers open which is usually on a summers evening.